Vidéographe is pleased to welcome French artist-in-residence Sylvanie Tendron. Since 2004, Tendron has explored behaviors associated with language and communication. Drawing on her own daily experiences, she exposes, with humor and derision, the misunderstandings, obstacles and absurd situations that can arise through encounters of difference. In her performance videos she tries to overcome almost farcical difficulties that lead to isolation or confinement, in so doing illustrating numerous examples of situations in which we try to connect with others by adapting to their language. Tendron has carried out residencies and presented her work in Bolivia, Morocco, Vietnam, France and Quebec. She lives in Toulouse, France. During the course of her residency at Vidéographe, the focus of Tendron’s video research and performative actions will be the relationship between audism and feminism. She will explore this relationship using a deconstructivist approach to phonocentrism as developed by Canadian Deaf artist Jolenta Lapiack, who has drawn on Jacques Derrida’s writings on the deconstruction of logocentrism to establish a causal relationship between phonocentrism and patriarchy. The work produced during the residency will be presented at Dazibao (Montréal) and AXENÉO7 (Gatineau) along with a selection of the artist’s previous works. This program will be accompanied by an artist’s talk. Sylvanie Tendron will also use her time at Vidéographe to establish and strengthen links with Montréal artists. 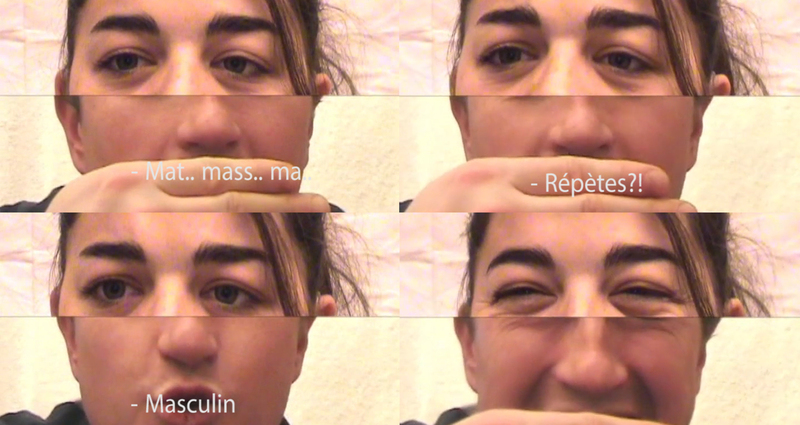 In the summer of 2017, she took part in a collective residency organised by SPiLL.PROpagation at Est-Nord-Est (Saint-Jean-Port-Joli) during which she worked with Deaf and hearing Quebecois artists. This new research and creation residency will offer Tendron the opportunity to deepen these relationships and to forge links between Vidéographe and Deaf artists based in Montréal.